Presenting … Flora & Pomona! Flora and Pomona is the name I have chosen for my soap company! Flora and you may know is the goddess of spring and flowers. Pomona, her less known sister, is the goddess of the orchard, the flowering fruit trees. When I was searching for a new name to best represent my budding business I thought of all the ingredients I use and the direction I want to take. It was clear in my mind that botanicals play an important role in my products, and my increasing interest in herbalism would continue to influence how I create my recipes. The soaps and bath products I make are made with the flowers and fruits of the earth: from sweet almond oil I use in most my soaps, to chamomile infusion in my latest shampoo bar. I have decided to keep the name Marsbalms for this blog, at least, for now, and I will continue to post updates on my latest developments. I will be building a website with a online store, and in the meantime will keep a webpage up with the essential information available. I am participating in this year’s Marché Angus, on October 7 and 14. Hope to see you there! When I stumbled across Amy Warden’s October challenge “Alternative Liquids” I knew I had to join. I have never soaped a challenge before, in fact, I haven’t been soaping for very long at all. Last year I discovered soapmaking and didn’t stop until I became pregnant and couldn’t deal with much anything with a smell. Flash forward to 2015: I’m a new mother, nursing every 2 hours and I’m sitting on a large bag of frozen breast milk. Wondering what to do with it I remembered a recipe I’d seen in a soaping book last year. Now I can’t remember who the author was, but I remember that she called the soap something like “Mother and Baby.” (I can’t find any mention of this book online anymore – it wasn’t Casey Makela, because she wasn’t allowed to publish her recipe for breast milk soap in her book). The basic gist of it was that nothing is as nourishing and beneficial to your baby as your breast milk, inside and out. I’d recently read about women curing baby acne, cradle cap, eye infections, and various nicks and cuts with breast milk, and I knew from before that milks and milk soaps are very soothing for your skin – so breast milk soap it is! 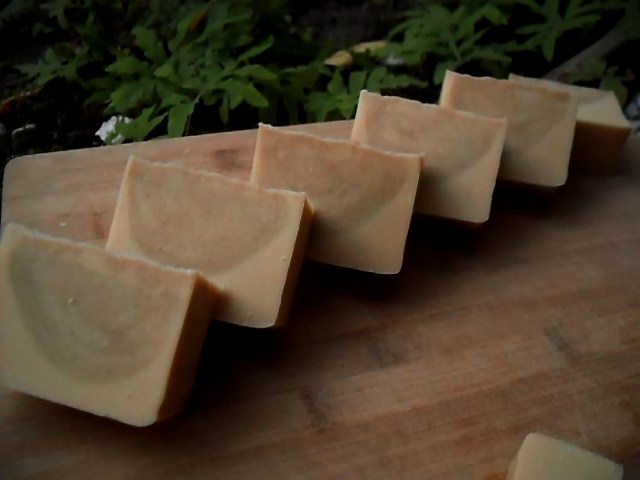 I made one trial batch, having never made a milk soap before, and was very happy with the result. 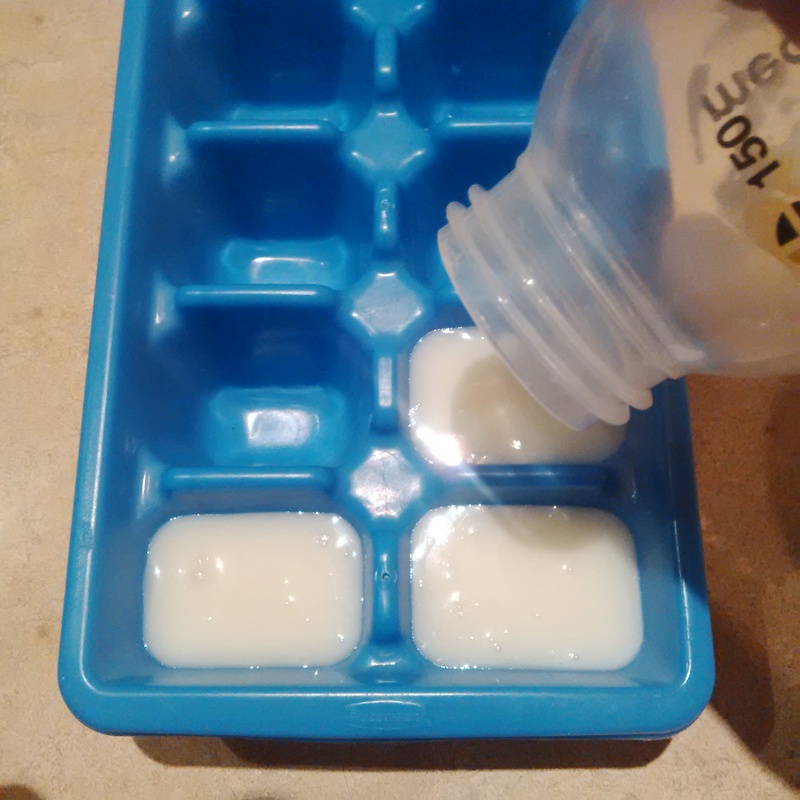 Not only had I found a way to use and preserve my milk, but I had soap for my baby to last her whole childhood – a soap that is as natural and customized to her skin as can be. To date, I have preferred not to use too much soap on my baby because baby skin is so sensitive. 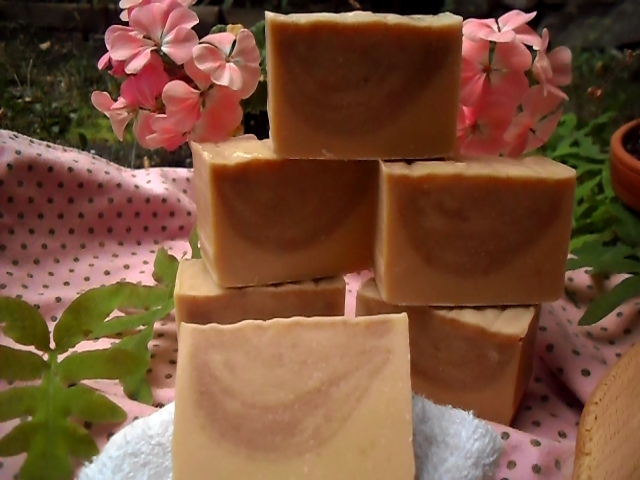 This homemade milk soap will be gentle enough even for a little baby. Recently breast milk has been in the spotlight as the new old super food. Apparently in China it’s become a hot commodity and body builders buy it online because it contains human growth hormones. But the benefits of breast milk have even been picked up by the mainstream: in Chicago you can get breast milk facials! So what is it about breast milk that makes people go ga-ga? And why would you use it to make soap? Apparently it has antibacterial and antiseptic properties. It also contains “anti-infectious and anti-inflammatory agents, growth factors, and prebiotics” (source). Although many of the bioactive agents may not survive freezing and heating (not to mention the lye) there are many beneficial fatty acids in human milk that do. Presumably, breast milk soap would have just as many if not more properties than say, goats milk soap, because it isn’t pasteurized and store bought milks still make a pretty nourishing bar of soap. The fats in human milk are composed of “palmitic and oleic acid” (source) as well as up to 20% of lauric and capric acid (source) (you may recognize these from the soapcalc). Lauric acid is often recognized as beneficial in treating acne and inflamed skin and also exists in coconut oil and goats milk (source and source). Caprylic Acid/Capric Triglyceride, again also found in goats milk and coconuts, act in a similar way by being a very gently anti-bacterial, anti-viral, and anti-fungal. But the main cosmetic use of the caprylic and capric triglyceride is as an emollient or moisturizing agent. Finally breast milk, like other milks, contains lactic acid which acts as an exfoliant, gently buffing away dead skin cells: this is why milk products, including breast milk, works so well as a facials leaving your skin feeling fresh and clean. It’s ecological: requires no transport, packaging, farming, etc. On that note, if you do have an oversupply please consider donating to your local milk bank. Now, enough research – onto the soap! 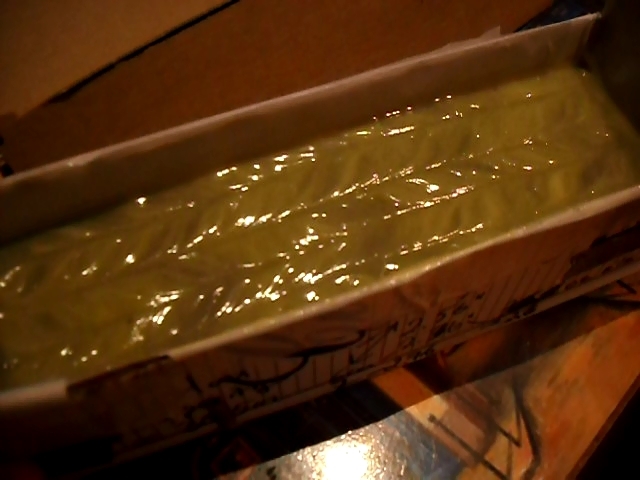 Since this is a milk soap, the first thing to do is freeze the milk so that it doesn’t burn when I add the lye. Also, I make sure to have lots of ice so that I can put the lye mixture in an ice bath. I also hope that if I soap at a low temperature that more of the nutrients will survive. Next, I measure out my oils. For this recipe I am doing a Bastille type with added Shea butter and my secret ingredient for the superfat, a rose-hip maceration and rose hip oil. Rose hips are rich in vitamin C (twice as much as oranges) and as a child I had to eat a lot of rose hip soup for this very reason. To my oils I added vitamin E, GSE (grapefruit seed extract) and sodium lactate to give my soap some longevity because I want my child to be able to use it throughout her childhood. When the breast milk and lye were both dissolved I added it to my oils. I believe that both liquids were at about 80F. Right away, before I even started stick blending, I could tell that the mixture was going to trace quickly. There were white strands in the bottom just from stirring and I blended it quickly to emulsion. At that point I added the lavender EO (not very much, because I like it really mild) and then separated my batter into two parts. One I added half of the superfat and the other I divided further into three parts: each with incrementally more rose hip powder dissolved in the rose hip oils. The idea was to get three shades of pink. I gave them a quick whisk with my small whisk and then set them aside to blend the neutral soap to trace and pour it. 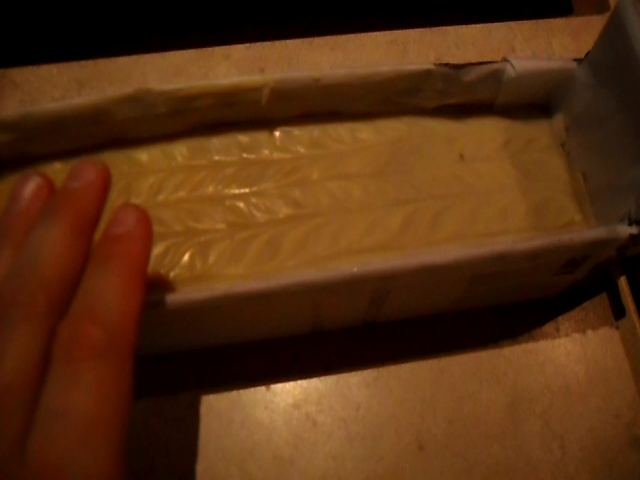 I didn’t have to blend the soap very much at all to get to trace and it set up very thick while I flitted about. I decided that one of the sections was too pale and added more rose hip powder to it. Then one by one, they all started going green. At first I thought maybe my whisk was aluminum and that it reacted with the soap, but the one part that hadn’t been touched was also turning green. Now afterwards I realize that rose hip powder must be a kind of ph indicator just like red cabbage. I proceeded as planned and tried to do a Holly swirl with the thick green batter, knowing in my heart that I’d end up with a discolored plop design. What I had imagined was a drop design throughout the soap, sort of like a milk drop. But I thought a drop swirl would be too boring, so I aimed to combine an in-the-pot swirl with a drop swirl using only two colours: the natural soap colour which will be an off white, and three shades of pink. I had recently bought some rose hip powder on the advice of a clerk at an herb store and was really excited to try it. 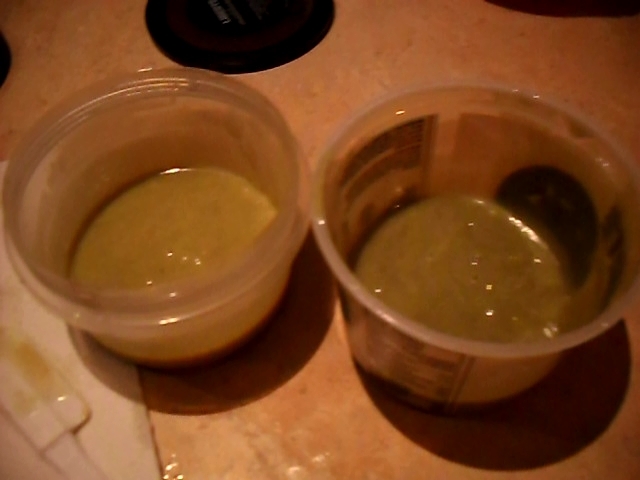 Originally, I was going to call this soap “Rosebud Baby” but that went out the window when I saw my soap batter turn green! I was even more surprised the next day when I peeked under the cover to see the soap has completely neutralized and turned a light tan colour! And of course, when I cut it, it was clear that the soap had set up too quickly to get much of a drop. More like, plop. When I cut it I discovered that the rose hip batter had maintained some colour – a tan, beigy colour – but clearly defined from the uncoloured soap at least. There were no swirls at all, or even lines (now two days later you can make out a few faint lines). Clearly the amount I put in each section wasn’t enough to differentiate it in its tan state. I’m sure if it had stayed pink it would have been more visible. 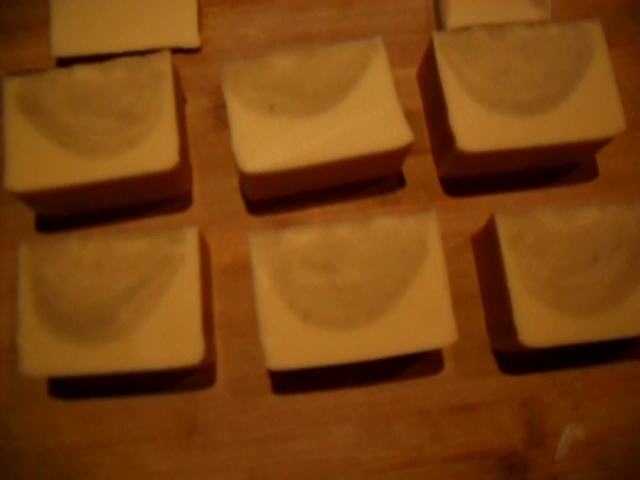 Also, the soap set up soo quickly that my pour didn’t penetrate the bottom layer – it just pushed it down. Oddly enough, I ended up with a soap looking much like I had first envisioned it: as a bosom leaking milk (I got the inspiration from Nourri Source’s logo, the Quebec nursing organization). The tan coloured “breast” with the milk coloured soap underneath. In the end, I have a perfectly good set of softly scented lavender breast milk soap. No bells and swirls, but it’s filled with motherly love…and tons of skin loving nutrients! A great gift for baby!